A corporate tax rate cut to 25 percent with no offsets would increase GDP and labor income by 1.97 percent, boost the capital stock (plant, equipment, and buildings) by 5.75 percent, and create the equivalent of 391,000 full-time jobs. Paying for the roughly $1.3 trillion static cost of cutting the tax rate, ignoring the growth effects, would require eliminating nearly every corporate tax expenditure in the code and would require further tax increases or spending cuts elsewhere. While eliminating some tax preferences has no negative economic effects, the majority of corporate tax preferences serve to lower capital costs and thus tend to negate the benefits of the lower rate when eliminated. In the most favorable case we simulated, eliminating most corporate tax breaks for a 25 percent rate would result in no growth. Ways to pay for the corporate rate cut in a pro-growth fashion include: (1) offsetting some of the base broadening measures by accounting for the dynamic revenue gains from the rate cut and/or income shifting; (2) indexing longer depreciation schedules to inflation and the time value of money; (3) offsetting any revenue shortfalls from the rate cut by eliminating wasteful business subsidies on the spending side of the budget; (4) phasing in the rate cut over time. This analysis was conducted prior to the release of Chairman Camp’s proposal and is based on the general goals for domestic corporate tax reform that have been widely discussed over the past year in both the House and Senate. Changes to international and individual tax provisions are excluded. There is broad agreement that the U.S. corporate rate is too high and that it is making U.S. businesses uncompetitive in the global marketplace. The U.S. corporate tax rate needs to be lowered to at least 25 percent to bring it into line with the average corporate rate of most developed nations. House Ways and Means Committee Chairman Dave Camp (R-MI) and others have set that as a goal but with the constraint that such a move be revenue neutral. What they mean by “revenue neutral” is that the reduction in federal revenue from the lower rate should be offset by eliminating various tax credits and deductions in the corporate tax code. It’s understandable that lawmakers would be cautious about cutting the corporate tax rate considering the fact that the Joint Committee on Taxation (JCT) has estimated the cost of cutting the corporate rate to 25 percent and ending the corporate Alternative Minimum Tax (AMT) to be roughly $1.3 trillion over ten years. However, this cost estimate is “static”; that is, it is calculated under the assumption that the economy is unaffected either by the tax rate reduction or by the elimination of the tax provisions used to pay for it. The economic gains from cutting the tax rate are ignored, which overstates the associated revenue loss and exaggerates the amount of revenue that must be found to achieve revenue neutrality. The economic damage done by eliminating various tax deductions is also ignored, exaggerating the revenue gains and putting at risk the economic gains if the wrong means of recouping lost revenue are selected. To do tax reform properly, lawmakers must weigh the need for fiscal prudence against the economic benefits of cutting the corporate tax rate. In balancing the costs, they should ask what the economic effects of trading the elimination of various tax breaks for that lower rate will be. Ultimately, they must compare the net revenue and budget effects of the tax changes—as the tax reform alters employment, wages, profits, and the taxes derived from them—to the net economic benefits for the population. We used our Taxes and Growth Model to answer these key questions. We find that reducing the corporate tax rate without offsetting revenue increases would benefit the economy at no permanent cost to the federal budget when the tax revenue from rising incomes and employment is taken into account. It would increase GDP and employment, resulting in a larger tax base and sufficient revenue growth over time to offset the initial tax reduction. By contrast, the majority of the revenue offsets would have adverse economic consequences. For some offsets, these effects would be particularly severe. 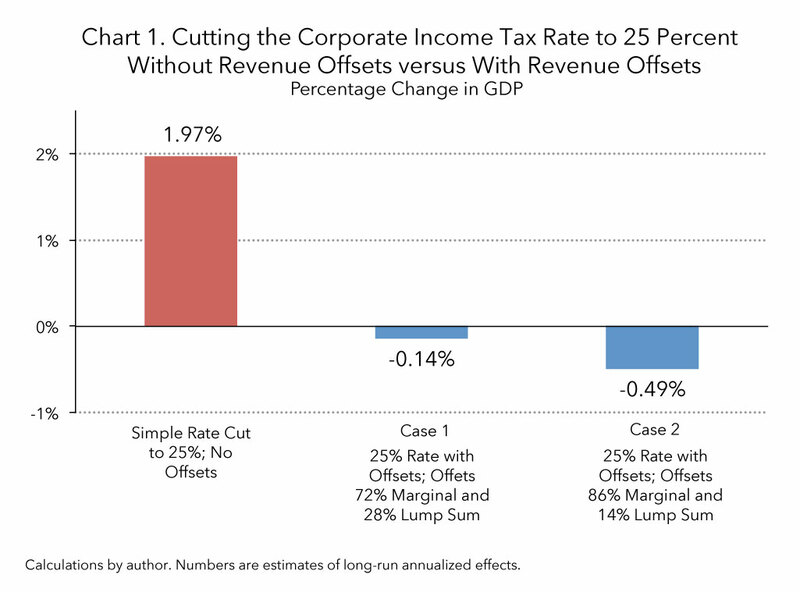 As a result, we estimate that, by the end of the process, the economic effects of eliminating sufficient tax preferences to pay for rate reduction would erase all of the economic benefits of cutting the corporate tax rate to 25 percent. There would likely be no net gain in GDP, income, or employment. With no net income growth, the tax offsets would not raise the expected revenue. What began as a static, revenue-neutral plan, with some hope for revenue gains from growth, could turn into a revenue loser. The government would gain nothing from its reform efforts. The public as a whole would either gain nothing or suffer lower incomes. Even with a tax rate reduction to 25 percent, GDP would be more likely to fall than to rise. Consequently, the revenue offsets would create many winners and losers. As a general rule, one should expect non-capital-intensive sectors to gain the most from a corporate tax rate reduction. This suggests that high tech sectors, professional services, and financial sectors would likely be winners. Blue-collar manufacturing and energy industries would likely be losers. These adverse outcomes of static, revenue-neutral tax reform—less growth of employment and income, no gain in federal revenue, no reduction in the federal budget deficit, and major capital reallocation costs and job-shifting difficulties in the private sector—would suggest that lawmakers either abandon static revenue neutrality as a goal or offset some of the apparent static cost of cutting the corporate tax rate with reductions in federal spending. The Joint Committee on Taxation (JCT) estimates that cutting the corporate tax rate to 25 percent and ending the corporate alternative minimum tax (AMT) would cost $1.299 trillion over ten years. This JCT figure does not count any macroeconomic effects from additional growth (it is calculated on a static basis). This is the benchmark the tax writing committees start from. (See Table 1.) Finding revenue offsets to generate $1.299 trillion during the ten-year budget window is a difficult task. Even if it were possible to eliminate all the items on the list of corporate tax expenditures, the resulting revenue dollars would not stretch that far. For example, in 2013, corporate tax expenditures totaled only $120 billion, less than the $130 billion average revenue increase needed to fund the tax rate cuts. Furthermore, some of the revenues to be gained by eliminating the tax expenditures would not immediately match the tax expenditure figures in the Treasury and JCT tables, because they would build up slowly over time, only reaching their full value many years beyond the budget window. (By contrast, the tax expenditure tables assume the tax expenditures had either never been enacted or had been eliminated years ago so that all current economic activity falls entirely under the no-tax-expenditure tax rules.) Adjustments must be made to accommodate the transitional revenue effects. Table 1 gives an overview of the corporate tax expenditures that we feel might be tapped as a means of paying for a corporate tax rate reduction. Further details are discussed below and are shown in Tables 4 and 6 later in the paper. Our adjusted estimate of revenues that might be raised over the budget window by delaying corporate capital consumption allowances (depreciation write-offs) is $384 billion. Closing selected tax expenditures that we judge might have limited economic impact (non-marginal “pay-fors” that would not raise the cost of incremental output and whose repeal would probably not harm GDP) might raise an additional $177 billion. Other selected tax expenditures, whose repeal would probably raise the cost of production and would probably reduce GDP, plus elimination of LIFO inventory accounting, would total $548 billion. The total offsets from these items sums to $1.108 trillion, leaving us about $191 billion short of covering the estimated static revenue cost of the ten percentage point rate cut. To reach the required $1.299 trillion for a 10 point rate cut, we assumed that $191 billion in other revenue increases or spending reductions would be found. They would either be of the non-cost-raising variety (Case 1) or the cost-raising variety (Case 2). In Case 2, more of the rate reduction would be paid for by items affecting marginal costs of production and GDP than in Case 1. These distinctions will affect the economic outcome of the policy shift (and our model runs). Based on the Congressional Budget Office (CBO) forecast of corporate tax revenue, these static revenue savings suggest that the capital recovery changes alone would pay for a 2.96 percentage point reduction in the corporate tax rate. The non-cost-related provisions might cover between 1.36 and 2.83 percentage points, and the cost-related offsets might fund between 4.22 and 5.69 points. Combined, they would reach the 10 percentage point target corporate tax rate reduction. *See Table 4 for derivation of these amounts by type. With these issues in mind, we have approached the estimation of the full 10 point corporate tax reform in stages. First, we estimate the economic and budget effects of simply reducing the corporate tax rate to 25 percent and ending the corporate AMT. No revenue offsets are assumed. This gives us a benchmark against which to show the consequences of adopting the revenue offsets to fund the rate cuts. Next, we model the economic and budget effects of a partial reform in which the tax rate is reduced only to the degree that it could be paid for by eliminating accelerated cost recovery, which is the largest and most economically significant of the tax expenditures. We make appropriate adjustments for the transition to a new schedule affecting new investment. Third, we outline the broader universe of corporate tax expenditures, judge which are most likely to be available to fund the rate reduction, and determine how best to model their effects on GDP. Finally, we estimate the economic and budget effects of a full revenue-neutral, 10-point rate cut and elimination of the AMT. We use the accelerated cost recovery offset and elimination of all the other available tax expenditures plus some additional revenues from other sources to make up the required static cost. We do two trials, one with additional revenues that are not likely to significantly affect the cost of incremental production (a key determinant of GDP) and another with additional revenues that would likely raise the cost of incremental production. This gives us a range of economic outcomes to illustrate the issues lawmakers should consider as they search for ways to reach revenue neutrality. Our first experiment is to simply cut the corporate tax rate to 25 percent and end the corporate AMT without any offsetting revenue increases. This gives us a baseline for comparison with the more revenue-neutral approaches which include revenue offsets. We found that cutting the corporate tax rate to 25 percent with no offsetting tax increases would increase GDP by 1.97 percent long term relative to the baseline projection, while the capital stock (plant, equipment, and buildings) would rise by 5.75 percent. Hours worked would rise 0.36 percent, the equivalent of 391,000 full time jobs, and wage rates would be 1.68 percent higher. (See Table 2.) The initial static revenue loss from cutting the corporate tax rate, $68 billion a year in 2014 dollars, would be completely recovered, and a bit more, through additional taxes paid on the higher incomes, raising revenue long term by about $7 billion annually. Everyone would be a winner. No industries would be losers. Modeling a static, revenue-neutral corporate tax rate reduction required two steps. First was to select which tax expenditures to eliminate to offset the static cost of the desired rate reduction and to find other revenue as needed. Second was to determine the economic consequences of the cut in the tax rate and the elimination of the tax expenditures and other revenue actions. We worked primarily from the tax expenditures list assembled by the Treasury Department and displayed in the Fiscal Year 2014 U.S. Budget. The budget shows estimated revenue costs of the various tax expenditures through 2018. We extrapolated the projected revenue gains through 2023 (the end of the current ten-year budget window). The major elements in the Treasury corporate tax expenditure list are shown, in a reordered manner, in Table 6 at the end of this document. How we used these figures is explained, in stages, below. As a first experiment, we modeled a partial corporate tax rate reduction that could be funded by delaying capital cost recovery allowances for investment expenses (slower tax depreciation) in the corporate sector. We singled out this particular trade-off because so-called accelerated depreciation is the largest and most economically significant item on the corporate tax expenditure list. Cost recovery plays a major role in calculations done by businesses to determine if an investment project is worth doing. The capital cost recovery rules have significantly different impacts across industries, and any modifications can result in substantial reallocation of capital and create major adjustment costs. Consequently, the tax committees should take special note of the deleterious effects of adverse changes in capital cost recovery provisions. Our model directly incorporates cost recovery allowances and the corporate tax rate into the calculations determining the cost of capital and the size of the capital stock. Therefore, the economic and budget effects of changes in cost recovery provisions can be easily compared along side the impact of the reduction in the corporate tax rate that they are meant to pay for. However, when the depreciation regime is changed to ADS to pay for the rate cut in a static sense (zero initial static cost), the result changes. We find that the tax rules governing depreciation (or “capital cost recovery”) have powerful effects on the cost of capital (the rate of return required to make a capital asset profitable after taxes). These effects are strong drivers of capital formation and economic output. We found that, even with the tax rate reduction, the slower write-offs would raise the cost of new plants, equipment, and other structures, which would depress investment and reduce GDP by about 0.83 percent. To the extent the reform utilizes changes in the cost recovery regime to fund the tax rate reduction, there would be no growth; indeed, the economy would be weaker as a result. The reform would appear to raise federal revenue by $3 billion a year on a static basis, but the weaker economy would cause federal revenues to fall by about $29 billion a year on a dynamic basis. *From the current modified accelerated cost recovery system (MACRS) to the alternative depreciation system (ADS) with straight line depreciation. We had to adjust the Treasury’s tax expenditure table cost estimate for the switch in the depreciation regime from MACRS to ADS in order to correctly reflect the fact that the new tax regime would be applied prospectively on new investment. The switch would realize its full revenue impact only gradually as the write-offs under the old rules for existing capital disappeared over time. The Treasury’s estimates of the cost of tax expenditures do not take transitions into account. They are calculated as how much higher revenues would be if the tax expenditures had never existed. In particular, the tax expenditure table number for accelerated depreciation assumes that the “normal” depreciation alternative had been in place long enough for the full difference to have been realized. This overstates the gains over the budget window from a switch to a less generous treatment. Therefore, to model a switch from one system to the other over the budget window and the years just beyond, we calculated how the transition to a new, slower depreciation regime would affect the revenue stream over time as the turnover of equipment and structures brought more of the capital stock under the new write-off schedules. We substituted the estimate of the static revenues year by year over the budget window for the long-run numbers in the tax expenditure tables. This procedure told us how much of the static cost of a tax rate reduction could be covered by the depreciation changes over the budget window (the reduction of the tax rate to 32.04 percent). This section discusses which tax expenditures we selected to fund the corporate rate reduction and which we omitted, how we categorized them as to their effect on tax rates and GDP, and the results of the modeling. Next, we excluded two items relating to deferral of foreign source income by financial and non-financial businesses ($467 billion), in part because our economic model does not deal with foreign production or cross-border income shifting. More importantly, lawmakers appear to be reserving revenues relating to changes in deferral of foreign source income for changing the current worldwide U.S. tax system into a more territorial tax system, which is a different issue. Third, we excluded revenues from several expiring provisions, as well as old tax expenditures that are currently raising, rather than reducing, revenue, from the analysis. These are items which involve the current collection of revenue from businesses that had been able to accelerate write-offs in the past and are now paying the piper. We also left untouched the orphan drug credit, which enjoys widespread bipartisan support. (This decision may be viewed as an example of the arbitrary nature of this type of reform process and analysis.) These exclusions totaled $21 billion. Finally, we excluded $145 billion in revenues from other tax expenditures on the corporate list that primarily benefit state and local governments, such as the tax exempt interest status of various state and local bonds. The tax expenditures list estimates tax savings to corporations that own tax exempt bonds. In fact, such bonds pay lower interest rates than taxable securities, and most of the gains from the tax exemption are captured by the issuers and not the bondholders. We doubt that Congress will broadly repeal the tax exempt status of state and local government bond interest. Disallowing the tax break for corporate holders of such bonds would simply cause the firms to sell them to others. Unless the bonds were made taxable for all holders, that shift would raise little or no revenue. These subtractions left $643 billion in tax expenditures that might be used to pay for a rate cut. Cutting the corporate tax rate clearly raises GDP. However, paying for a rate cut by eliminating tax expenditures may negate the growth. The economic effect of eliminating tax expenditures depends on the nature of the tax expenditures. Some corporate tax expenditures do nothing at the margin to add to the incentive to produce additional output. These tax expenditures are often subsidies that primarily shift production from one set of firms to another, or substitute one type of input for another, with little impact on total production economy-wide. Some may so distort the mix of assets and products that they do more economic harm than good. Repealing those items would not reduce GDP (and might increase it); using the revenue to reduce the corporate tax rate would boost GDP. Examples include charitable contributions by businesses, the treatment of some financial businesses as cooperatives instead of taxable corporations, and subsidies that encourage the substitution of ethanol for gasoline or of hybrid cars for conventionally-powered vehicles. Many other tax expenditures, in our judgment, clearly affect the cost of producing additional national output. These include provisions that are deductions for the real costs of producing additional output or are alternative means of accounting for production expenses, including certain credits and allowances such as those related to amortization, depletion, and immediate expensing of capital assets for small businesses. Most of these “at the margin” tax provisions are in the tax code to offset situations in which the pure income tax would undercount costs and overstate income or in some other manner involve double taxation of income. They are roughly equivalent in their economic effect to a tax rate reduction; repealing them would be equivalent to a tax rate increase. Repealing them in isolation would reduce GDP. Repealing them to pay for a portion of a tax rate reduction would neutralize the economic benefits of that portion of the tax rate cut. With these considerations in mind, we divided the remaining $643 billion in tax expenditures into two groups according to whether we believe them to have either a negligible or a significant effect on the cost of incremental production and, thereby, on GDP. Those regarded as lump sum or unrelated to the cost of producing additional output ($177 billion) are grouped together in Table 4, below, and Table 6 in the Appendix. Those considered to raise costs at the margin ($467 billion) are also grouped together. Some of these choices are clear cut. Others are judgment calls. We also assumed elimination of LIFO (the last-in, first-out inventory cost accounting method). The Treasury tax expenditure list does not include LIFO as a tax expenditure compared to the supposedly normal income tax method of first-in, first-out inventory accounting (FIFO). The Joint Committee on Taxation tax expenditure list does include the difference between LIFO and FIFO as a tax expenditure. The administration has recommended eliminating LIFO, raising $81 billion over the budget window, and the tax committees appear to be including the provision in their reform proposals. (See the Additions in Table 4.) LIFO plus the marginal items total $548 billion. Combining the $548 billion in marginal items with the $384 billion replacement revenues estimated for ADS and the $177 billion in lump-sum tax expenditures yields a total of $1.108 trillion. We judge that to be the amount available to offset the static revenue cost of corporate tax rate reduction in a revenue-neutral exercise. *Office of Management and Budget, Analytical Perspectives-Budget of the U.S. Government, FY 2014, Table 16-2 (2013), http://www.whitehouse.gov/sites/default/files/omb/budget/fy2014/assets/spec.pdf. Figures for 2019-2023 extrapolated by author. See Table 5 for additional detail. **Expiring items, orphan drug credit, negative tax expenditures now increasing revenue. Our selected tax expenditure items ($1.108 trillion) fell somewhat short of raising enough revenue over the budget window to cover the estimated $1.299 trillion static cost of the desired 10 percentage point reduction in the corporate income tax rate to 25 percent. We have assumed that the tax writing committees will look beyond the tax expenditure list for an additional roughly $191 billion in static revenue offsets to plug the gap. We consider two cases with two types of plugs. In the less damaging case, we assume that the additional offsets involve policies that would not result in any permanent damage to GDP. These might include eliminating uneconomical subsidies or other corporate welfare on the spending side of the budget, or a three-year phase-in of the rate reduction. Examples might include ending Export-Import Bank loans or insurance, low interest loans to money-losing alternative energy projects, and agricultural subsidies. One could even look outside the corporate sector for other cuts in discretionary federal spending or transfer payments. In the more harmful, and perhaps more likely case, we assume the additional revenues come from economically damaging reductions in allowances for actual business costs such as advertising expenses, development costs associated with intellectual property, or limits on the deductibility of interest on debt. These would be expected to affect production costs and sales at the margin. Depending on which type of gap fillers the committees find, we estimate a range of economic outcomes that reveal less damaging or more damaging dynamic consequences of the tax changes. As explained above, one group of revenue offsets consists of relatively non-cost-related or activity-distorting tax expenditures that do not add to GDP and might be eliminated without hurting growth. They are not big enough to cover much of a tax rate reduction, but whatever rate cut they pay for would boost GDP. We assumed that repeal of these non-marginal items would do no economic damage. We modeled the portion of the rate cut paid for in this manner as a pure rate reduction. The corporate rate reduction funded by these items generated the limited positive growth effects of the tax reforms. The other group of tax expenditures would have an adverse effect on output. The Tax Reform Act of 1986 removed most of the highly questionable tax expenditures that were clearly out of line with basic tax principles. Most of the remaining major corporate tax expenditures are clearly some form of pro-growth deduction reflecting, more or less cleanly, the timing and quantity of actual business costs. The accelerated depreciation provisions fit this category but are built directly into our model. Many other “at the margin” items on the tax expenditure list are credits and allowances that relate to very specific industry situations. They are too detailed to build directly into the code of a general macroeconomic model of the economy. Nonetheless, repealing these items would be a back-door rate hike that would effectively negate a revenue-equivalent portion of the 10 percentage point rate reduction they funded. A clear example of a tax-rate-equivalent tax expenditure is the domestic production deduction (also known as the Section 199 manufacturers deduction), which is a deduction of 9 percent of taxable profits from U.S. manufacturing activities from taxable income. It is equivalent to a 3.15 percentage point reduction in the 35 percent corporate tax rate for eligible activities. Repealing it would constitute a tax rate increase. Another example is the repeal of LIFO. We dealt with elimination of LIFO by using the revenue estimate presented in the administration’s budget proposals and treated it as a tax rate increase of equal dollar amount. In Table 1, we displayed two cases, depending on the nature of the additional revenues raised to close the funding gap. In Case 1, about 4.22 percentage points of the 10-point drop in the corporate tax rate was paid for with cost-raising items. We added that amount back to the 25 percent target tax rate and modeled it as a net rate reduction to 29.22 percent. In Case 2, about 5.69 points of the rate reduction were paid for with cost raising items. We modeled that case as a net rate cut to 30.69 percent. The part of the rate cut funded by the “not at the margin” tax expenditures was assumed to have its full growth impact. The remaining portion of the rate reduction funded by the cost recovery changes was handled by the model’s cost of capital equations. We found that paying for the $1.299 trillion static cost of cutting the tax rate, ignoring the growth effects, would require eliminating nearly every corporate tax expenditure in the code and would require further tax increases or spending cuts elsewhere. Depending on which other sources of funds were tapped to fund the shortfall in offsets from the tax expenditures, we found that the offsetting revenue raisers would eliminate all, or more than all, of the growth from the rate reductions. In Case 1, relying more on non-marginal offsets, long-term GDP would fall 0.14 percent, or about $24 billion a year (in 2014 dollars), relative to the baseline projection. Hours worked would fall 0.02 percent, losing the equivalent of about 24,000 full time jobs, and wage rates would decline 0.13 percent. A projected long term static federal revenue gain of $11 billion a year would be trimmed to $5 billion after the adverse economic adjustments. In Case 2, relying more on cost-raising offsets acting as tax increases, GDP would decline by 0.49 percent relative to the baseline. Hours worked would fall 0.09 percent, eliminating 94,000 full time equivalent jobs, and wage rates would fall 0.42 percent. Instead of a static, long-term federal revenue gain of $7 billion a year, revenues would fall $12 billion a year on a dynamic basis. Both results compare unfavorably to the long-term results of the simple, no-offset rate cut to 25 percent described earlier in which GDP would rise by 1.97 percent, or $334 billion a year, compared to the baseline. Hours worked would rise 0.36 percent, the equivalent of adding 391,000 full time jobs, and wages would rise by 1.68 percent. Because of the economic gains, annual federal revenues would rise $7 billion on a dynamic basis. The difference between the simple rate cut and the worse Case 2 results is telling. Cutting the tax rate without raising other taxes to pay for it would generate nearly 2.46 percent more GDP (about $358 billion a year), create nearly 500,000 more jobs, bring about a 2 percent higher wage rate, and leave federal revenues about $19 billion higher on a dynamic basis than would be the case if the rate cut were paid for in a static, revenue-neutral manner. The corporate tax rate cut has to be at least revenue neutral. Spending cuts are off the table; only tax offsets can be used to pay for the rate cut. Moreover, all tax pay-fors are to be within the corporate tax expenditure area. The tax committees nonetheless want the tax cut to be pro-growth. Some tax expenditures are wasteful and do no economic good. They should be traded for a lower tax rate. However, many pay-fors publicly hinted at in the House effort (or explicitly described in the Senate documents) would be tax increases on additional capital formation. As such, they would negate the growth effects of the anticipated corporate rate reduction. Most remaining tax expenditures in the corporate area relate to cost recovery in one way or another. Repealing them would overstate income and constitute a back door tax rate increase. If this is the case, it is unlikely that the reforms would generate any significant economic improvement even if the corporate tax rate were reduced substantially. We found that simply cutting the corporate tax rate to 25 percent with no offsets to pay for the rate cuts would be the best policy. Within a few years, the added growth would lift federal revenues from all sources above the pre-tax-cut levels. If the tax committees were to employ a revenue estimating method that took the revenue gains from growth into account, they would find less need to offset the initial revenue loss by raising taxes elsewhere and would run less risk of undercutting the growth that a rate cut could generate. If the short-run budget impact is a concern, it could be countered by phasing in the rate reduction over a three to five year period without reducing the long-run economic gains. One particularly damaging revenue offset under consideration is to reduce the value of the capital cost recovery allowances (depreciation write-offs). We found that repeal of accelerated depreciation would do more damage to the economy than could be offset by the corporate rate reduction it would pay for in static terms. That offset would result in a drop in GDP. It would increase the current tax bias against capital-intensive industries and blue-collar jobs, and result in more, not less, economic distortion. If the tax committees feel compelled to restrict cost recovery to raise revenue over the budget window, they should reduce some of the economic sting by indexing the delayed write-offs for inflation. Better yet, they could allow the deferred write-offs an annual increase at a market interest rate with some real return, more fully reflecting the time value of money than an inflation adjustment alone. Such a real adjustment-plus-inflation could result in economic gains, rather than losses, compared to current law. It would also protect the value of the write-offs against any future resurgence of inflation, which would reduce the risk element of the cost of capital. It would push some of the initial revenue cost of the rate reduction past the budget window, allowing the economic growth to generate higher revenues before the static revenue cost of the tax cut comes due. Our modeling effort focused on the effects of the tax rate reduction and the tax offsets on the cost of capital and labor. That is what drives GDP, income, and revenue in our model. Other potential effects, which we do not model, could ease the revenue and budget constraints even further and facilitate the rate reduction. A lower corporate tax rate would encourage the shifting of reported corporate income to the United States instead of encouraging firms to park patents and other intellectual property, and their associated royalty income, in foreign subsidiaries. It would encourage firms to incorporate and establish their headquarters and research facilities in the United States instead of reorganizing to become foreign companies for tax reasons. These effects would gain additional tax revenue for the United States above the revenues from growth we find in our model runs. Congress should get the tax reform process out of the numerous boxes it has built for itself. It could reduce the corporate income tax in stages without employing damaging revenue offsets that would negate the economic benefits of the tax rate reductions. It should get out of the static, revenue-neutral box by use dynamic scoring of the gains from growth to recognize the affordability of a net static tax reduction. If it cannot bring itself to formally adopt dynamic scoring, it should give up on static revenue neutrality and simply enact some amount of net static tax cut, implicitly anticipating some amount of revenue reflow from added growth. If Congress wants to raise money to pay for the static rate reduction, it should look beyond the tax expenditures and act to close subsidies on the spending side of the budget that encourage uneconomical corporate activity. It should avoid tax increases that would clearly act to impede the formation of productive capital. The whole country, workers, savers, retirees, and consumers alike, would benefit enormously from a broader reform effort designed with the economy and job creation in mind. The JCT, the Office of Management and Budget, and the Treasury carefully describe the dollar estimates in the tax expenditure list as long-run effects. They are the differences between what the current tax system brings in and what the altered tax system would have brought in if the tax expenditure provisions had not existed for some time. Removing these provisions would not necessarily save the same amount of money in the first year after repeal, or over the ten-year budget window, as the figures in the table would suggest. The chief example of this problem is a change in the depreciation rules, as discussed above. In addition, repeal of the tax expenditures might be countered to some extent by changes in timing (such as when a company might realize a capital gain, or pay dividends). Other behavior changes assumed by the JCT and Treasury regarding the mix of investment, the method of financing investment, the management of inventory, and so on, would affect their estimates. There are also interactions among the tax expenditures. For example, the deduction for domestic manufacturing activity lowers taxable manufacturing income by 9 percent after all other deductions are taken. The amount of the deduction is reduced insofar as other tax deductions have already reduced taxable income. In many cases, however, the tax expenditure numbers are roughly the same as a hypothetical revenue estimate because the activities or items in question are short-lived and must be renewed or repeated annually. For the most part, we took the estimates in the tables as presented, for want of any reasonable alternative. Our re-estimation of the capital consumption allowances over the budget window was a major exception. The JCT might find that the repeal of the tax expenditures would raise less revenue than we have assumed, making the task of cutting the tax rate even harder. Alternatively, it might assume advantageous behavior changes due to alterations in the tax provisions dealing with the international sector that we have not modeled. These could shift some amount of foreign investment to the United States, giving some lift to domestic output. A shift of intellectual property to the United States from abroad could raise U.S. tax collections and reduce the need for repealing the most beneficial tax expenditures that broadly promote investment. By contrast, a plan that is revenue neutral in the long run beyond the budget window would require a bigger change in depreciation and a larger tax increase within the budget window. The slower write-offs and lack of a net tax cut in the out-years would generate a bigger drop in GDP than the window-neutral plan with an out-year tax reduction as was modeled in our exercise. Corporate estimates only, reorganized by category, selected years; numbers are millions of dollars. * Derived from: Table 16.2: ESTIMATES OF TAX EXPENDITURES FOR THE CORPORATE AND INDIVIDUAL INCOME TAXES FOR FISCAL YEARS 2012-2018 Office of Management and Budget, Analytical Perspectives-Budget of the U.S. Government, FY 2014, Table 16-2, 2013. Available on the Internet at http://www.whitehouse.gov/sites/default/files/omb/budget/fy2014/assets/spec.pdf. Figures for 2019-2023 extrapolated by author. Or which currently raise, not cost, revenue. Credit to holders of Gulf Tax Credit Bonds. The JCT table is reproduced in Scott A. Hodge, Stephen J. Entin, & Michael Schuyler, Using Dynamic Analysis Makes Tax Reform 30 Percent Less Challenging, Tax Foundation Special Report No. 210 (Aug. 26, 2013), Table 1, https://taxfoundation.org/article/using-dynamic-analysis-makes-tax-reform-30-percent-less-challenging. Some readers may be uncomfortable with a tax rate reduction modeled with no revenue offsets, which might widen the budget deficit, at least in the short run. Some analysts may feel the wider deficit may have some adverse impact on GDP. If so, the reader may think of this experiment as being paid for in the short run by offsetting spending reductions, primarily in transfer payments that are generally assumed to have little impact on production and total output. Alternatively, one could consider phasing in the rate reduction over several years to limit the short-run cost. Office of Management and Budget, Analytical Perspectives: Budget of the U.S. Government, Fiscal Year 2014 (2013), at Table 16-2, http://www.whitehouse.gov/sites/default/files/omb/budget/fy2014/assets/spec.pdf. Accelerated depreciation is depreciation faster than straight line, or over shorter asset lives than the old tax “guideline” lives that are supposed to match “economic depreciation,” the rate at which assets either wear out or become economically obsolete. The guidelines are largely guesswork, and they do not reflect the fact that the assets have to be paid for when bought, not over time. Investors incur the cost of the asset immediately, and the tax depreciation rules fall short of reflecting the full present value of the cost, because a deduction delayed is devalued by the time value of money and inflation. In income tax jargon, anything faster than economic depreciation is branded a tax expenditure, even though the economically ideal treatment of cost recovery is immediate expensing. 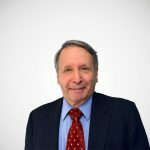 See Stephen J. Entin, The Tax Treatment of Capital Assets and Its Effect on Growth: Expensing, Depreciation, and the Concept of Cost Recovery in the Tax System, Tax Foundation Background Paper No. 67 (Apr. 2013), at 11-13, https://files.taxfoundation.org/docs/bp67.pdf. ADS is the depreciation system that U.S. multinational firms are currently required to use to determine their foreign source income. It tends to overstate income, depress the apparent foreign tax rate, and thereby hold down the foreign tax credit. ADS, with long asset lives and straight line depreciation, is as severe a capital recovery regime as the old Bulletin F schedules of World War II through the Eisenhower administration. All the increases in the capital recovery allowances of the last fifty years would be undone. The weaker economy is the source of the negative GDP effects referred to in the introduction, even when a broader package of tax expenditures, some of which do not affect GDP, is eliminated to fund a deeper tax rate cut. In earlier work, we looked at methods of offsetting the economic damage from longer assets lives by augmenting deferred write-offs for inflation and possibly some real return on capital (a range of plans from inflation-adjusted cost recovery to full neutral cost recovery systems which are equivalent to immediate expensing of investment in the year it is made). See Stephen J. Entin, The Neutral Cost Recovery System: A Pro-Growth Solution to Capital Cost Recovery, Tax Foundation Fiscal Fact No. 398 (Oct. 23, 2013), https://taxfoundation.org/article/neutral-cost-recovery-system-pro-growth-solution-capital-cost-recovery. In the Baucus plan, the elimination is applied to existing assets as well as new ones. It has been suggested that such a retroactive tax on past actions would be economically efficient, in that it could not discourage investment already undertaken and should not reduce GDP. This is short-sighted analysis. Failure to grandfather existing assets would make people distrust the stability of the tax rules going forward. They would fear further hits on new investment after the fact. The added risk would certainly reduce future investment and GDP. See Michael Schuyler, Retroactive Taxation and the Baucus Proposal, Tax Foundation Fiscal Fact No. 405 (Dec. 9, 2013), https://taxfoundation.org/article/retroactive-taxation-and-baucus-proposal. On the other hand, there is already an implicit federal tax on state and local bond income, as the otherwise tax-exempt interest counts toward the income thresholds (modified adjusted gross income, or MAGI) at which Social Security benefits become partially taxable. Additional tax-exempt interest raises the tax owed on the benefits. The accelerated cost recovery allowances act very strongly at the margin. We dealt with them separately, as described above. The Haig-Simons, or broad-based, income tax subjects income from capital to multiple layers of tax and misdefines income in a number of ways that lead to overtaxation of saving and investment. It was set up in this manner to aid in the redistribution of wealth. It is not the economically ideal tax system. The tax expenditure tables assume that this distortionary tax base is the norm and that any relief from it is a deviation. This is true even for provisions that reduce anti-investment or anti-saving tax biases and result in a more neutral tax system. For a detailed exposition of the differences in what would constitute “tax expenditures” if one assumes an alternative neutral consumption tax base, see Office of Management and Budget, Analytical Perspectives: Budget of the U.S. Government, Fiscal Year 2009 (Feb. 2008), ch. 19, http://www.gpo.gov/fdsys/pkg/BUDGET-2009-PER/pdf/BUDGET-2009-PER.pdf. For an explanation of tax neutrality and the anti-saving biases in the Haig-Simons definition of income, see Stephen J. Entin, Tax Incidence, Tax Burden, and Tax Shifting: Who Really Pays The Tax?, IRET Policy Bulletin No. 88 (Sept. 10, 2004) (see especially pgs. 28-30), http://iret.org/pub/BLTN-88.PDF. For more on the concept of tax expenditures, see William McBride, A Brief History of Tax Expenditures, Tax Foundation Fiscal Fact No. 391 (Aug. 22, 2013), https://taxfoundation.org/article/brief-history-tax-expenditures. For a discussion of tax biases in the treatment of capital investment, see Stephen J. Entin, The Tax Treatment of Capital Assets and Its Effect on Growth: Expensing, Depreciation, and the Concept of Cost Recovery in the Tax System, Tax Foundation Background Paper No. 67 (Apr. 24, 2013), https://taxfoundation.org/article-ns/tax-treatment-capital-assets-and-its-effect-growth-expensing-depreciation-and-concept-cost-recovery; see also Arthur P. Hall, The Concept of Income Revisited: An Investigation into the Double Taxation Of Saving, Tax Foundation Background Paper No.17 (Feb. 1997), https://taxfoundation.org/article/concept-income-revisited-investigation-double-taxation-saving. Repeal would be equivalent to a tax rate increase of less than 1 percentage point measured against all corporate income. The manufacturers credit was enacted as a substitute for prior export subsidies (DISC, FISC, and ETI) ruled illegal by the World Trade Organization. It applies only to specified manufacturing and other select activities. Tax expenditures that apply to limited sectors of the economy may result in some distortion of economic output, which some analysts argue is a reason not to have them. However, the adverse GDP effect of raising the tax burden in these areas is often significantly larger than the gains from reducing distortion. This is the case where the incentive is applied to a sector that suffers some form of discrimination under the ordinary income tax, as with capital intensive industries affected by inadequate cost recovery allowances that fall short of the full cost of investment. These tax expenditures do more to mitigate other distortions than to create new ones. The correct solution is to end the discrimination; in this manufacturing case, that could be done by adopting full and immediate expensing of all capital outlays. https://taxfoundation.org/article/three-differences-between-tax-and-book-accounting-legislators-need-know. There is a transition issue in switching from LIFO to FIFO. The Obama administration’s budget proposal and the discussion draft circulated by Chairman Baucus require an immediate shift from LIFO to FIFO affecting all inventory, which imposes a catch-up tax on assets acquired in the past. This retroactive effect is highly unusual in tax legislation outside of the estate and gift tax area. This makes a portion of the revenue lump sum, although the change will fall at the margin on all future inventory acquisition. Lacking data on the age of current inventory holdings, we have scored the money as a marginal hit on new investment. According to Treasury and OMB, “The [tax expenditure] estimates…do not necessarily equal the increase in Federal revenues (or the change in the budget balance) that would result from repealing these special provisions, for the following reasons. First, eliminating a tax expenditure may have incentive effects that alter economic behavior…. Second, tax expenditures are interdependent even without incentive effects.” See Office of Management and Budget, Analytical Perspectives: Budget of the U.S. Government, Fiscal Year 2014 (2013), at Table 16-2, http://www.whitehouse.gov/sites/default/files/omb/budget/fy2014/assets/spec.pdf. The JCT states, “A tax expenditure calculation is not the same as a revenue estimate for the repeal of the tax expenditure provision for three reasons. First, unlike revenue estimates, tax expenditure calculations do not incorporate the effects of the behavioral changes that are anticipated to occur in response to the repeal of a tax expenditure provision. Second…[b]because tax expenditure analysis focuses on tax liabilities as opposed to Federal government tax receipts, there is no concern for the short-term timing of tax payments. Third, some of the tax provisions that provide an exclusion from income also apply to the FICA tax base [and other federal taxes], and the repeal of the income tax provision would automatically increase FICA [and other federal] tax revenues as well as income tax revenues.” See Joint Committee on Taxation, Estimates of Federal Tax Expenditures for Fiscal Years 2012-2017, JCS-1-13 (Feb. 1, 2013), at 24, https://www.jct.gov/publications.html?func=startdown&id=4504. The interaction with the FICA tax is mostly found with respect to the individual side of the tax code, not the corporate side being modeled here.